Please check with your agent to confirm up to date pricing and for further details regarding this trip. This is a fantastic 5 day package with loads of extras to really get to know this region of Spain. More time to explore Valencia and the chance to discover the fabulous coastal town of Peñiscola before descending on Buñol for the world’s largest organised tomato fight. In the afternoon you meet up with your guide and fellow Tomatina travellers in the hostel breakfast area. This meeting is a chance for you talk about what’s happening over the next 5 days. After this, we all go on an enlightening walk around Valencia. We hit the main sights; the old town, the shopping area and all the restaurants and bars. It’s the first night, so you’ll probably have a few drinks with your new travellers at a local bar. If you are feeling a little delicate after the partying last night then chill out around the hotel and Valencia. However if you are up for a bit more sightseeing join your Guide for an optional visit to the fabulous town of Peniscola. This is a small town located by the sea and is steeped in history going back to the Renaissance. Today you'll have a chance to get active with, watersports or beach volley ball. For all those craving a bit of culture head to the Old Quarter and visit the 14th Century castle. Tonight we'll head down to the beach for some drinks at a local beachside venue. Use your time in the morning to put the finishing touches on your La Tomatina outfit. Mid-afternoon, it's time to hit the beach and chill out. Alternatively, grab an opportunity to check out the America's Cup Port and hire a bike to get there, checking out the Turia gardens on the way. Tonight, we'll go out to a couple of local bars and get prepared for our tomato fight tomorrow! Today is a day unlike any other. It’s La Tomatina. We leave Valencia early today and head to Buñol. The journey is short, and on the way your Busabout guide will talk about the origins of this crazy festival. On arriving you’ll really start to feel the party atmosphere…it’s impossible not to! Thousands of excited people are dressed in strange clothes preparing to throw tomatoes around a small medieval town. To add to the madness, the pre-event consists of locals and tourists struggling to climb a greasy pole. The prize at the top is a delicious leg of Spanish ham. Bang! And the tomato hurling begins! Big overripe tomatoes are provided by trucks that make their way through town. The tomato fight lasts an hour; more than enough time for all the streets and people to become completely smothered in red tomato juices. After the last tomato is thrown its cleaning time! Fire trucks, locals, anyone who has a hose really, all work together and clean the town and party-goers. After this we head back to Valencia and prepare for our big night out. Tonight is our big Official Tomatina Party. Take time doing your make-up, go for a sleep, take a walk on the beach, whatever you do just be prepared to party until the sun comes up! After breakfast the day is yours to explore Valencia. If you are departing Valencia with Busabout, please meet your Guide at the Purple Nest Hostel at 1.15pm to join the coach heading to Madrid. Prices are updated frequently and are subject to change. Please call 1866 940 2031 for most up to date pricing. Departure Data is currently unavailable. 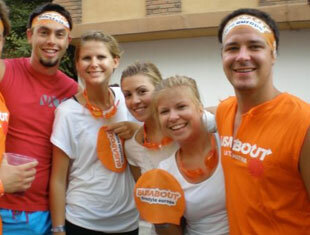 Busabout is Europe's Hop-on Hop-off travel network for free-spirited budget-conscious travellers. You choose where you go and how long you stay. Experience destinations yourself and take control of your travels rather than being bound by a tour itinerary. The door-to-door convenience, security and awesome social life Busabout allows you to maximize your budget and time. Busabout Adventures: Croatia Sailing, Greek Island Hopping, Spain, Italy, Egypt, Morocco, Eastern Europe and the top European Festivals.